See that photo up there? 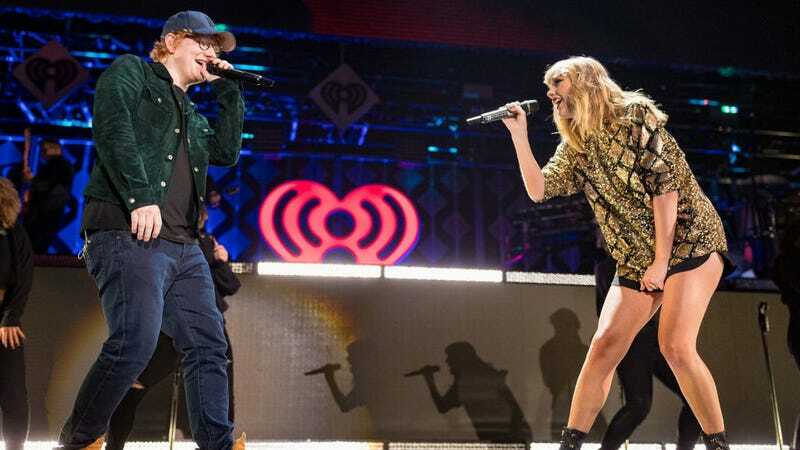 It’s something of an optical illusion, and not because those two people—pop powerhouses Ed Sheeran and Taylor Swift—have their feet chopped off. The fella on the left is 5'8", and the gal on the right is 5'10". And yet, you’d be reasonable for thinking he’s taller than her in most situations. According to Swift, this is something Sheeran does all the time. He is, apparently, guilty of positioning himself in such a way that in whatever room or frame of a photo he’s in, he appears taller (“better,” as she says). She posted a video of the pair to Instagram that addressed this hard-hitting concern, watch that below. Beta bro masculinity manifests itself in many ways, whether it’s through acoustic balladry or appearing vulnerable at any given moment. But Swift’s video proves that the most beta of betas (or “soft men,” for you non-internet folk) want to be the tallest dude in the room, even if they have to employ visual tricks to get there. Know anything about the height-scheming fire-haired boy? Reach us at tips@trackrecord.net.